In British Columbia, Indigenous Health supports Northern Health to partner with First Nations, Métis and Inuit peoples to build a health system that honours diversity and provides culturally safe services. Indigenous Health supports the health care system to be culturally safe for Indigenous people, offering inclusive health services and a health care system that is respectful of Indigenous people in northern BC. The Indigenous Health team supports Northern Health leaders and staff by providing Indigenous-specific health resources, including presentations, tools and processes; actively participating on Northern Health committees and working groups; and engaging Indigenous individuals and communities. They purchase seats annually for Northern Health employees to take the Sanyas Indigenous Cultural Safety training and they help Aboriginal Health Improvement Committees develop local cultural resources for health practitioners to learn about Indigenous peoples and communities in northern BC. 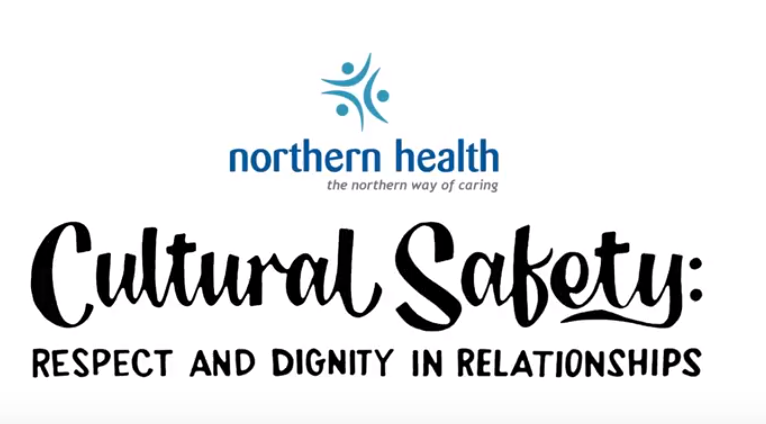 The Indigenous Health team of Northern Health (formerly Aboriginal Health), has developed a 5-minute animated video which introduces cultural safety and related concepts in an easily understandable way. It invites health care providers to participate in making the health system more culturally safe for Indigenous people and families. Entitled “Cultural Safety: Respect and Dignity in Relationships”, the video can be found on YouTube at: https://www.youtube.com/watch?v=MkxcuhdgIwY. Source: Northern Health. (2018). Indigenous Health – accessed November 14, 2018.